Performers include: Jessie T. Usher, RonReaco Lee, Erica Ash, Teyonah Parris, Tichina Arnold, and Mike Epps. This comedic series follows the life of a hard working, young basketball star who is thrust into the limelight after signing a huge contract with a pro basketball team in Atlanta. Cam Calloway (Jessie T. Usher) is a basketball phenom in his early 20’s. He’s come a long way from the Boston projects. His next big challenge is deciding who to help (or not help) on his way up. Cam’s cousin, best friend, and confidant, Reggie Vaughn (RonReaco Lee) is both loyal and watchful. It’s his job to protect Cam and to make sure that he stays focused and stays away from distractions that includes his own family members.They confront the challenges of carrying opportunistic family members and their strong ties to the impoverished community that they come from. M-Chuck (Erica Ash) is Cam’s older sister, his staunch defender, and biggest fan. Accompanying the family to Atlanta, she’s a forthright, blunt, and loyal sibling who’s suspicious of the traps of fame and its impact on her brother. Her boldness often chafes against the expectations the city has for the family being new Atlanta Royalty — and also the Cam “brand” that Reggie works hard to foster. Beautiful and refined, Missy Vaughn (Teyonah Parris) starts to live a good life for her and Reggie in Atlanta. Unfortunately, she’d rather not be there. Whether it’s getting ZCam involved in charities or picking a country club for her and Reggie, Missy’s social awareness is sometimes out of place with the misfit s of Cam’s family. Cam’s very proud mother is Cassie Calloway (Tichina Arnold), a woman who is very ready to live a comfortable life. She’s brash and unafraid of the consequences of her actions. Still, she is the rock of her family and wants to do what’s right. Uncle Julius (Mike Epps) is the family’s de facto patriarch and Cassie’s brother. He’s going to enjoy his nephew’s success but would be there for the family even if the good life went away. Missy pressures Reggie to make a play for their independence. M-Chuck’s satisfaction comes at the cost of Cassie’s. Cam rebuffs Flaherty. First aired: October 15, 2017. What do you think? 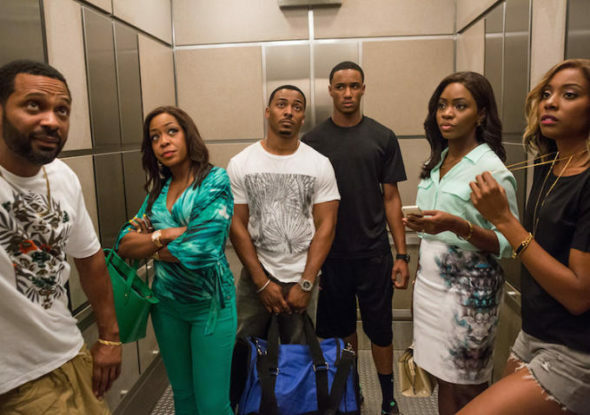 Do you like the Survivor’s Remorse TV show? Do you think it should have been cancelled or renewed for a fifth season? I loved this show! Clever, witty, entertaining and insightful. What’s up Starz network? How could you ax such a wonderfully unique show??? I just seen they cancelled survivors remorse and I wanna cry I loved this show and all 4 seasons and every episode they had these channels be cancelling all the awesome shows. What is wrong with this network? This is a great show! This is actually a plot like people want up know about and this was perfect! Especially for a 30 minute show. They are stupid for ending this and I will cancel starz for this debacle. Not sure why they ended the Series. Survivor’s Remorse was a great show. I loved the story lines and how the writers kept the show up to date as to what was going on in the real world. I’m very saddened to hear that the show would be renewed for a 5th season. I applaud the writers and producers for having the courage to shine a light on a number of controversial but important societal issues. Although it has it’s lighter moments (even fewer with the departure of Mr. Epps), I think of the show as more of a dramedy especially with the more serious overtones of its second season episodes. I truly appreciate the content (albeit the profanity and vulgarity could be minimized) and look forward to each episode. Do hope it will have a long life. I love, love, love the character of Missy Vaughn and greatly admire the actress who so skillfully brings her to life, Teyonah Parris. Move over Ms. Tyson, Ms. Woodard, and Ms. Davis to make room among the acting icons for Ms. Parris! !